And here it is! 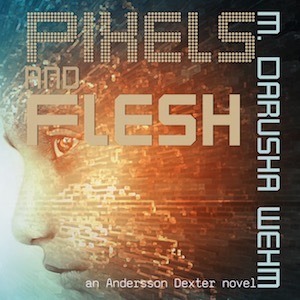 The first episode of the audiobook version of Pixels and Flesh! Have a listen for free over on my Patreon site. The podcast is a Patreon exclusive, but I’ve made the first episode public, so everyone can get a taste of what’s to come. if you like what you hear, you can join the Patreon at the Audiophile level for as little as $2 a month. Expect new episodes each week. The ebook will be available to patrons at the $3/month or higher level as soon as the podcast is complete, before the book becomes available worldwide at most ebook and online paperback retailers in mid-December. I hope you enjoy the podcast and thanks for making this happen! Hi, Zane. The book will be released this December, in ebook, paperback and audio. Audio will be available directly here and will hopefully be up on Audible soon after.